THANATOS (θάνατος) is the God of Death and Death itself in Greek mythology, a son of Nyx, the goddess of the night, and Tartar, the god of the bottomless abyss of the eternal darkness. 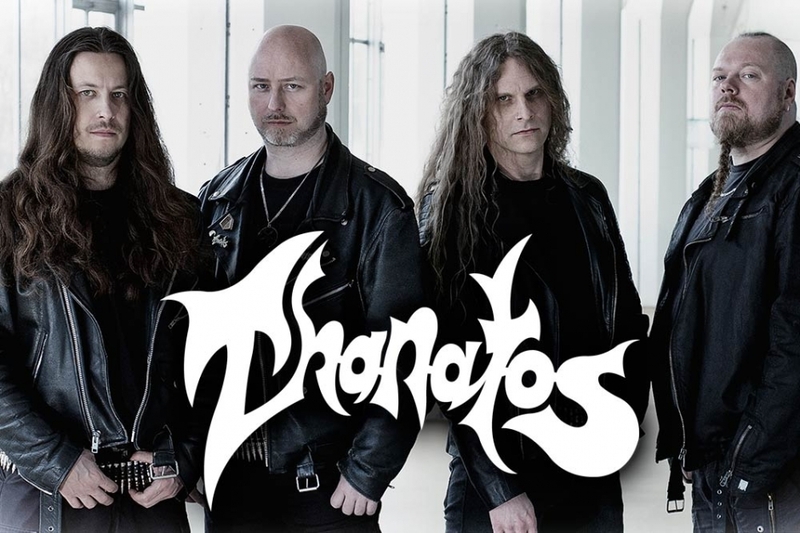 However, in the encyclopedia of extreme metal, Thanatos stands for an equally deadly death/thrash combo from Holland whose history reaches as far as 30 years in the past, till 1984!!! Though the band remained unjustly in the shadow of other Dutch death metal titans like ASPHYX, PESTILENCE or GOREFEST their second album titled "Realm of Ectasy" from 1992 belongs clearly to the best of the scene and not only the Dutch one of that time. THANATOS returned to the scene in 1999 and they let everybody know on a regular basis they still have not ended up in the abyss of the eternal darkness. With their sixth studio recording called "Global Purification" they did earate the stale rooms of priests` dormitories in the Vatican. “Global Purification” is also the name of the sixth full length album of THANATOS, an illustrious name that has been haunting the underground metal scene since 1984. After several demo tapes and line-up changes, THANATOS released two classic thrash/death metal albums in the early 1990's via the notorious Shark Records: “Emerging From The Netherworlds” and “Realm Of Ecstasy”. The band shared the stage with the likes of Kreator, Sepultura, Death, Napalm Death, Bolt Thrower, Autopsy and Death Angel to name but a few. In 1992 THANATOS split up due to a variety of reasons, but was revived in 1999 by founding member Stephan Gebédi featuring a new line-up. The third THANATOS album, “Angelic Encounters”, was released in 2000 via Hammerheart Records. Despite great reviews the band was not really satisfied with this album, due to the production lacking the power the music demanded. Two more personnel changes followed. In 2002 the band recorded four new songs and two cover songs in a small 8-track studio to attract some interest from record companies. Baphomet Records/Red Stream released these recordings as the “Beyond Terror” mini CD. In 2003 THANATOS signed a recording deal with Greek label Black Lotus Records, resulting in the release of “Undead. Unholy. Divine.” in 2004. This album was mastered by Attie Bauw, the man responsible for mixing Judas Priest’s classic “Painkiller” album amongst others. While recording their fifth full-length album “Justified Genocide” in 2006, the band was informed of Black Lotus Records’ bankruptcy. The recording sessions for the album were put on hold and once again the future for THANATOS looked very bleak. At the end of 2006 Stephan formed Hail of Bullets which grew into the monster we all know now. Guitarist Paul also joined the reformed Asphyx and drummer Yuri and bass player Marco joined Melechesh. In the years that followed, all band members were extremely busy with their other bands/projects, but in 2009, a quarter of a century after the band's first incarnation, “Justified Genocide” was finally released by Dutch label Deity Down Records. In 2012 THANATOS signed a deal with the Century Media Records to re-release their complete back catalogue and in April 2013 Century Media offered the band a multiple album deal. To coincide with the band’s 30th (!) anniversary in 2014, THANATOS now unleash their 6th full length studio album upon mankind. Produced by the band themselves and mixed and mastered by Dan Swanö, “Global Purification” contains ten brand new songs which see the band outdoing themselves in terms of power and sheer aggression. Despite the speed and ferocity there are enough hooks, memorable riffs and melodies to have these songs cemented in your brain after a few listens.